I heard a story about on old stray dog today that I wanted to share with you. This old dog was hanging around these folks home in the country. He wasn’t friendly at all, but rather nervous and shy. The man said that he figured the dog had been abused and it was obvious it was neglected. The woman was scared of the dog though and wanted it gone. Somehow they decided to shoot it to be rid of it, a choice I completely disagreed with. Anyway, they baited the poor old fellow with some food and while it was eating took a shot at him, which missed. I guess the dog must’ve been starving because he was only slightly alarmed, stopping to look around a moment, and then going back to the food. A second shot rang out and also missed, which sent the dog running for his life. A third and final shot also missed its mark before the dog disappeared over the hill. The next day the lady when the lady came home from work that old dog was back. But today he sheepishly greeted her at her car. Timidly the lady touched the dog who then wagged his tail. This was probably the first affection the old dog had received in a long while and it was from the hand that tried to kill him only a few hours before. Happily the dog is still around, being fed and petted on a regular basis now. The man asked me what I thought about the dog and I said “Well, I think you ought to have tried making friends and feeding him before shooting at him”. I wondered how many times we have done similar things to people we come into contact with in our lives? Jesus said that the way we treat others is how we treat Him; in our actions we show just how close our fellowship with God really is, not so much as in our words. How did you treat the last “old dog” that you came across? Today I had a few errands to run, including a trip to Wal Mart. To my pleasant surprise, shortly after entering the store I ran into three members of my church family. We had a very pleasant little conversation that included each of us making mention of our choir leader. For you that don’t know him, Bro. Buddy Merritt is one of the kindest, humblest folks I know and his love for our Lord just, well, radiates about him. Anyway, the four of us agreed that more than once Buddy has stood and spoken almost verbatim what was on our own heart during his testamony. One of us even joked that it was kind of amazing how that could be; and that we ought to be more apt to get up and say what God has put on our heart as soon as He does so! After leaving the store, on my way home in my truck I was thinking about our conversation and those thoughts led me to this conclusion: We are all different in how we express our love and our praise for God. But for four different people, five including Bro. Buddy, to get the same praise-filled thoughts, at times simultaneously, demonstrates that, even in our different ways and with our different “styles” of expression, we are truly in one mind and of one accord. Yes, I may say it differently than you, you may have more emotion than I, but we are still worshipping Him Who is worthy in “Spirit and truth”, just as He desires us to. Psalm 119:72 The law of thy mouth is better unto me than thousands of gold and silver. When I was younger I never looked forward to sports in gym class too much. There were always so many kids in the games that is made it much less fun and really less physically profitable; when you’re playing softball with 35-40 kids you don’t get much playing time or exercise. But oh how I loved the pick-up games after school! Often times there weren’t enough of us to field two teams. But that didn’t matter to any of us: we all got play that much more! Just a little while ago Billie and I got home from a small group Bible study at church. It was such a blessing to get together with some of our brothers and sisters and dig into God’s Word as a group. I think these smaller, informal studies are a lot like those pick-up games we used play after school; with the fewer number of folks involved, those that attend seem more inclined to “get in on the action”. 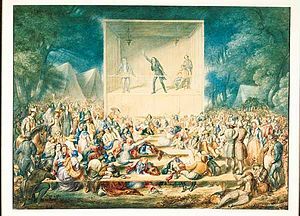 I think often times we are a little inhibited during Sunday school, I mean no one wants to offer up an answer in front of the whole church that they are a little unsure of. But in a smaller, less formal setting we are much more apt to dive right in. And doing so we learn so, so much more, both individually and as a group. If you’re not involved in a small group study I encourage you to get involved with one. And if your church doesn’t currently have one, start one up! You’ll be surprised by the interest that you’ll find others have. And I am certain that you’ll be blessed and learn a lot in the process. The past two days have been preperation for apple butter making day, today. Due to other obligations, I’ve not been able to help thus far. And it saddens me because I know the fellowship I’m missing out on. The kettles have been on the fire for hours by now and I’ve yet to make my way over to the church. Honestly though, there’s nothing I can do today up till closer to finishing time anyhow. But I’m getting ready to head on over in just a bit. I can be moral support for the laborers and then already there when time come that I can help. If you’ve never taken part in an old fashioned apple butter making you are missing out on a lot of work, fun and fellowship. I encourage you/ if you get the opportunity, to give it a try and see if I’m right. 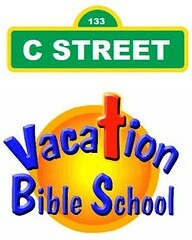 VBS is quickly drawing to a close, only two more nights left. I find myself wondering if I’m looking forward to it ending or wishing it wouldn’t. On the one hand I am tired, physically. Each night I find myself being the last one ready to go, about 30 minutes later than everyone else and holding up the Brother who heads up VBS. The last two days I’ve needed to go over to the church for a few hours in the afternoon to clean up and do touch up work on projects. And then there are the ‘special’ requests from kids not in my class for items that I just can’t refuse. On the other hand, I’m having a ball. I so enjoy watching the kids work and see them create items for themselves. And then there’s the little ones who are enthralled with the whole process and so interested, too. I should say many adults are also very interested in the leather-work as well. And we can’t forget the wonderful Bible lessons each night! There is just so much fun, fellowship and learning that I hate to see it end. Kind of makes me look forward to next summer already….